Afraid of setting your mouth on fire? 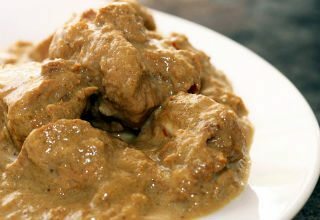 Do you always order a korma? Well, there’s nothing wrong with a good korma. They’re delicious. But by chickening out on the spicy curries, what you can choose from the menu is very limited. 1. The first step is to understand that good spicy food is not just hot for the sake of being hot. The right blend of spices and chillies will make the food taste good. Food that tastes good is something we all want. So don’t avoid spicy foods because you think it’s only there for showing off. 2. Start with curries that are only slightly spicier than what you’re currently used to. 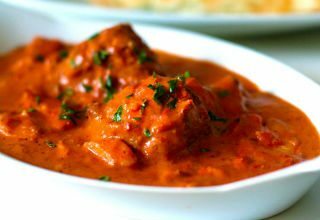 For example, rogan josh and dhansak dishes are a little more spicy than kormas. Don’t dive straight into a vindaloo if you’ve never had anything spicier than pilau rice. Identify, at this stage, which spices are your favourite. 3. When you are comfortable with your new spice level, increase the spiciness. Do this by eating hotter foods that contain the spices that you have identified as your favourite. Perhaps a jalfrezi or a madras. 4. Keep progressing with the level of spiciness in your food. This is the key, once you’re comfortable with one level, move up to the next. Soon, you’ll be eating things you never would have tried before. A vindaloo maybe? If you eat something that you can’t handle, a glass of milk is the best way to cool your mouth. Water may help but it will be nowhere near as effective as milk. Yoghurt or cream added to the curry is also good. 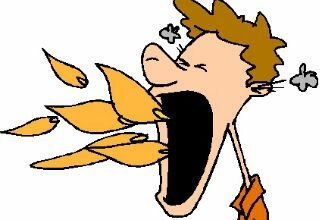 It’s important that you eat slowly so that you don’t take in too much capsaicin (the hot chemical) in one go. There is nobody out there that cannot adapt to spicy food. So give it a go and, above all, enjoy! Waiters – you have been warned…. Brangelina blow £3000 on Curry!